Difference between revisions of "Obsidian"
Obsidian is a material found naturally in [[Nether]] or created in the normal World when a [[Water|water]] flux makes contact with a [[Lava|lava source block]] . Obsidian is a material found naturally in [[Nether]] or created in the normal World when a [[Water|water]] flux makes contact with a [[Lava|lava source block]]. Obsidian can only be mined with a [[Diamond Pickaxe]] and is the toughest ''mineable'' block. This block resist explosions. [[Nether Eye]]s, when killed, could drop Obsidian. 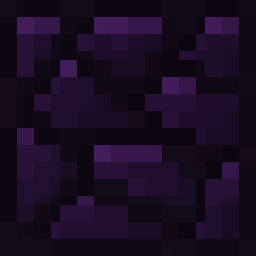 Obsidian can only be mined with a [[Diamond Pickaxe|Diamond Pickaxe]] and is the toughest ''mineable'' block. [[Nether Eye]]s, when killed, could drop Obsidian. My whole Mine Blocks house.png|A ''Mostly'' Obsidian house. Click to enlarge. Found naturally: Yes. In Nether. Obsidian is a material found naturally in Nether or created in the normal World when a water flux makes contact with a lava source block. Obsidian can only be mined with a Diamond Pickaxe and is the toughest mineable block. This block resist explosions. Nether Eyes, when killed, could drop Obsidian. A Mostly Obsidian house. Click to enlarge. Obsidian is the second most resistant block in Mine Blocks and Minecraft (in the first place is the Bedrock). The design of the Obsidian has been updated in the update 1.27, such as Water, Lava, Acid, Dirt, Netherrack, Sign, Odd Rock, Odd Rock Ore, Topaz, Fiber, Dragon scale, Moss, Raw chicken, Cooked chicken, chicken nugget, Golden apple seed, Golden apple sapling, Clay, Paper, Lever and Rope.